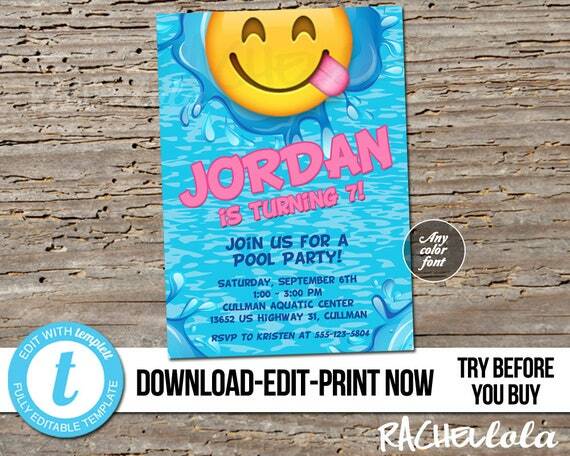 This INSTANT DOWNLOAD printable emoji pool birthday party invitation is perfect for your swim party, lake party, or pool party. It is a digital invite. Within minutes of ordering you can edit and customize your template through the easy to use web app, Templett. No need to install any fonts or software. 1. Download the Instant Download Instructions PDF from Etsy. 3. Follow the link sent through email to access your template. 4. Make sure to save your template periodically while making changes. 5. When you are ready to print, download the PDF or JPEG. 6. Print and trim your template (if necessary). You can print yourself, or have it printed at a local or online print center (like Fedex or Staples) or print at a photolab (like shutterfly, mpix, or walgreens). Don’t forget to save your work as you edit. You can access and re-edit your template for up to 6 months after purchasing. This item is for personal use only. Do not redistribute or resell. This is for a digital file only. You will download and edit yourself. No printed material will be shipped to you.